Even though this poll isn’t very accurate, the results were, to my surprise, nearly a three-way tie with about 20 counts each. Maybe it’s because of how often we encounter cursing in our society that the Christian stance on it varies from person to person. 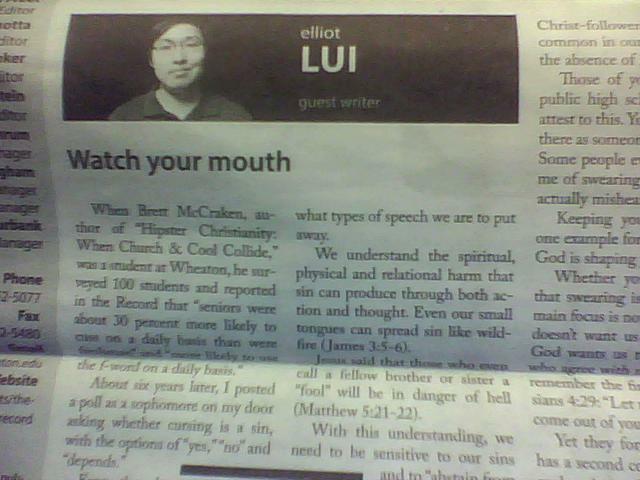 There was even a student last year who posted on the forum wall that people at Wheaton College should swear more. Conversely, I believe that profane expressions are sinful and should be avoided. Throughout the Bible we are commanded to avoid letting such speech come out of our mouths. Paul wrote “Let there be no filthiness nor foolish talk nor crude joking, which are out of place…” (Ephesians 5:4) and to “put away…obscene talk from your mouth” (Colossians 3:8). Some people focus more on the linguistics technicalities or situations, and that can be debated on a different forum. To me, these verses gave a clear description of what types of speech we are to put away. We understand the spiritual, physical, and relational harm that sin can produce through both action and thought. Even our small tongues can spread sin like wildfire (James 3:5-6). Jesus said that those who even call a fellow brother or sister a “fool” will be in danger of hell (Matthew 5:21-22). With this understanding, we need to be sensitive to our sins and to “abstain from every form of evil.” (1 Thessalonians 5:22). The Psalmist saying, “keep your tongue from evil and your lips from speaking deceit” (Psalm 34:13). More importantly, cursing is not just an issue of verbal communication. It goes deeper than that. There are people who think that swearing is “bad” because of how crude, vulgar, or offensive they sound. They think it’s just the word or the meaning that makes it bad. This underlying belief is translated to action when they elongated vowels as though obscuring the curse makes it less offensive. [Original: …when they substitute an * for “I” in the s-word, or saying “eff” for the f-bomb, or even prolong the “I” sound when pronouncing the b-word. (If you have no idea what I am talking about, ask a friend. I’m sure they would know)]. I find it very humorous when someone apologizes before cursing or even whispering the word itself during a conversation. There’s not a huge difference! The motivation behind those expressions is what matters. If the heart is filled with evil, the evidence of it will spill out of the mouth. Jesus said that “out of the abundance of the heart his mouth speaks.”(Luke 6:45) and “it is not what goes into the mouth that defiles a person, but what comes out of the mouth” (Matthew 15:11). Perhaps another vital reason to avoid cussing is our witness as Christ-followers. Profanity is so common in our society today that the absence of it is noticeable. Those of you who went to a public high school, as I did, can attest to this. You would be known as someone who doesn’t curse. Some people even falsely accuse me of swearing when in fact they actually misheard me. Keeping our mouths pure is one example for others to see how God is shaping you for good. This issue does not end by avoiding swear words, but to go the opposite direction. The goal is to become a person of encouragement, edification, and thanksgiving. God created our mouths and they are good. They have the ability to bless and to curse. For God’s glory, let us use it for good. In the spirit of Philippians 4:8, whatever is true, whatever is honorable, whatever is just, whatever is pure, whatever is lovely, whatever is commendable, if there is any excellence, if there is anything worthy of praise, speak about these things.